Fun! If you're familiar with the game. I think a lot of people are coming into this without having played the browser game (imagine Kantai Collection, with swords, and there you go), and having that background definitely helps with comprehension of the plot and digesting having 17 characters thrown out at once. Otherwise, it's admittedly a rough transition for someone coming into the franchise without preparation. At it's core, it is pretty swords-turned-boys save history. Hanamaru will be the sort of slice of life iteration, and the 2017 series seems to be shaping up to be the "serious" and probably more general audience one. Characters seem on point with their in-game versions, though the theme of Hanamaru as of the first episode is MUCH lighter than how the game has been going with kiwame developments. A lot of fan favorites show up right off the bat (Hasebe, Mitsutada), as well, with all of the "starter" swords showing up. Art direction is keeping it light, cute, and relaxed. Expect liberal use of super deformed/chibi/whatever you kids call it these days (which doesn't happen in the game) and bright colors. The Revisionists are pretty well animated, giving a pretty horrifying vibe. Most of the humor is things in reference to the game itself that newcomers might not get. Ishikirimaru's the slowest sword in the game at this point, Ikeda Inn map is a nighttime indoor map where you don't take oodachi. Souza Samonji was Oda Nobunaga's sword, thus his resentment and gloomy personality for being taken as a war trophy. Heshikiri Hasebe's dedication to his master being paramount to his in-game lines. It's little touches like that, where it's clear the writers are catering to people familiar with the game. No description yet, so here you go. Just out of curiosity i decided to watch the first episode even though there is no description. I dont know what can and can't be said but Ill try to sum this up. The story follows individuals that are swords given human form. They are sent all over out history to stop an anti-government terrorism group. The swords fight these monsters in hopes to protect history from being rewritten and all the chaos that would ensue soon after. I enjoyed the first episode as its not your typical run-of-the-mill samurai show. It has interesting characters that all have unique personalities and swords to match. The fighting scenes are awesome (and decently bloody :D). Since each sword is different they all fight with different flavors. Non of which seem boring. Since I have only seen one episode so far all I can offer is a tiny minuscule amount personal insight. But I promise you all that I will be watching way more of this show. I believe this one is worth the watch. This series has a mix of action, humor, fluff, and character development. There are a lot of Sword Warriors to keep track of, but the antics they get up to makes it more than worth it. This anime is an overlooked gem that can really put a smile on your face. I absolutely love Touken Ranbu and have been playing for almost two years now. The anime (both Katsugeki and Hanamaru) are enjoyable, especially if you are a fan of the game and characters. It's an amazing feeling to see your best boy actually move around, talk more, and interact with other characters. I have to say though, that it is not really recommendable to those who have no knowledge about the game. The anime and game itself do have some Japanese history to it, so if you're not interested in those kind of topics this isn't the show for you. If you do have prior knowledge to basic Japanese history, then it won't be that much of a problem. There may also be some game terminology that newcomers might not catch (ex. Types of swords- Tantou, Wakizashi, Uchigatana, Tachi, Ootachi, Naginata, Yari. or the term Kiwame) If you play the game or know Japanese these things are easy to pick up on. I understand why people write it off as boring since it is a slice of life/ fleshing out of characters that fans already know of and love. It is basically made specifically for those who have prior knowledge of the game and lore. If that kind of show is not your cup of tea then give this one a pass. If you're still willing to give it a try and you actually find it enjoyable, then why not try out the game? There is a wiki page dedicated to allowing foreigners to access the game. I was so sad when I first came across Touken Ranbu to see that it didn't have an anime. I can see people who haven't played the game would have a hard time getting into this anime because the characters are kind of thrown at you quickly. If you can get over the amount of characters that are thrown at you with no real background to them you should be fine. The cuteness of it is worth it. Since I've played the game I came into the anime already having an attachment to the characters so that helped a lot. It's mostly a slice-of-live following swords that are given a human shell. Near the end of the season there is a slight shift in the tone, but it goes back to the happy after a moment of heart jerking. The art is relaxed and the expressions are spot on. Give it a chance, and if you have time, try out the game. You will probably get a great deal more enjoyment from this anime if you are a fan of the game it's based on. It isn't particularly required, however, if you understand the basic premise, which gets explained in the opening. The plot is less about the protection of history, however, and more about the swords themselves and their lives between the fighting, making this more of a slice of life anime to my mind. It's fun and silly, occasionally touching, but you won't find epic battles or deep plots here. That's not the point of this anime; it's just a little for-fun check-in on popular swords and showing their interactions, as well as getting bits of trivia about the people who once carried or created these swords- some of which is reflected in the personalities of the swords themselves, if to greatly exaggerated effect. My only complaint is that the quality of the animation is a bit dodgy; on this budget, it's certainly easy to see why a slice of life plot was the aim and not a battle-heavy one. I love it. So hard. Omg. I love swords. I love men. I love sword men. I think this is a very very sweet and easy way to get used to the characters of Touken Ranbu before the "real" anime comes out. I find all the boys sweet and charming. I can see where others won't really like it, but it's worth it if you watch with an open mind. The animation and voice acting is lovely. And each episode ends with a song sung by one of the characters featured in the episode. Colin from The AniMonday Podcast here! Each week we hit the "random" button on Crunchyroll, and must watch whatever pops up. 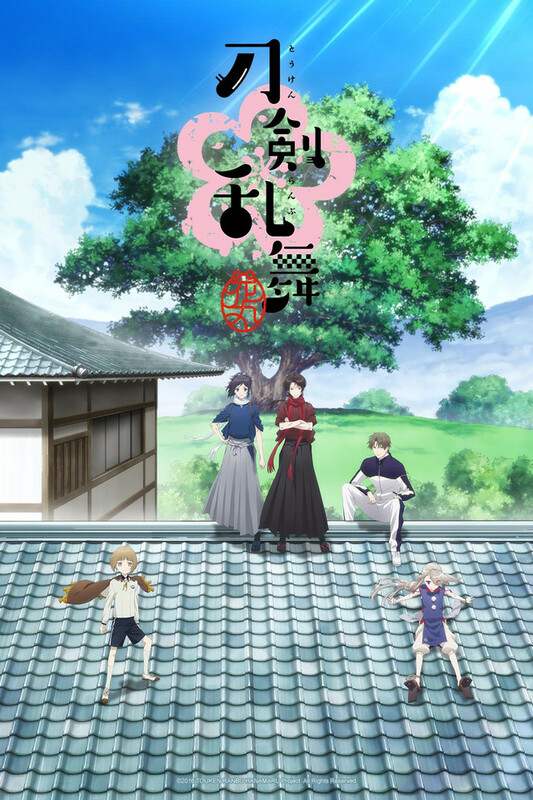 We did a podcast about Touken Ranbu that you should definitely check out, whether you've seen a couple of episodes or not! The first episode was very enjoyable, but the anime isn't for everyone. The artstyle is nice, but not the best, very interesting and weird anime, I'm going o watch it as a comedy. Really confused on how I would rate this anime on a non-personal level just because it is so out there. That being said, I'll revise my review later when I get a better understanding of what this anime wants to be. Its a video game I guess? So it has an internal fan base who probably will like how it fleshes out a favorite game. I watched 3.75 episodes of this and dropped it from que. Maybe on episode 4 or episode 7 or whatever it gets great. But right now, its really, truly, steadfastly boring. Animation is OK, but really, the plot and the dialogue on this show are just so-so. The fighting was also just meh. Even when they lost a fight there were no obvious historical consequences. I wont be watching this further.